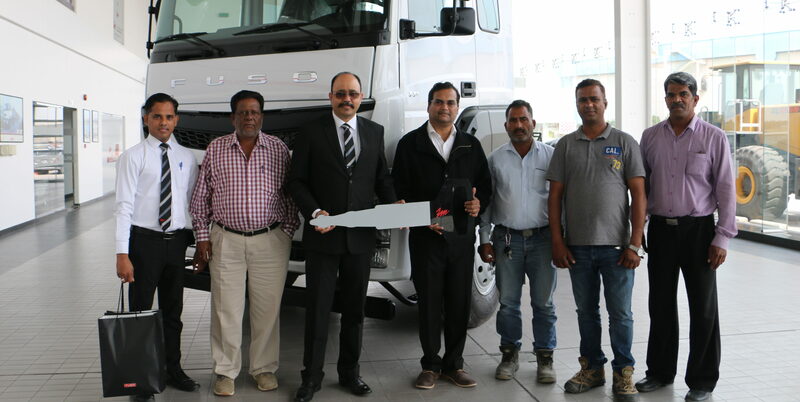 Zayani Motors, the exclusive distributor of Fuso Trucks in the Kingdom of Bahrain, recently handed over a Fuso TP truck to Bahrain Dutch Foundation (BDF), the leading Geo-technical Engineering Contractor in Bahrain. A special ceremony was held at Zayani Motors showroom in Ma’ameer on February 27, 2019, marking the delivery of the truck, which is the latest heavy-duty truck introduced by Fuso, equipped with the latest technologies to ensure a strong and reliable performance. Receiving the truck were Mr. Milind Naik, General Manager of BDF, and Mr. Girish Lele, Senior Piling Engineer at BDF in the presence of officials of both companies. The all-new high powered, robust and fuel efficient truck is believed to contribute to the huge developmental projects being implemented in the Kingdom as part of its economic vision for the year 2030 and continued development plans. The TP comes with a robust six-cylinder and 11.97-litre engine with maximum output of 400hp/1,900rpm and maximum torque of 2,000Nm/1,100rpm. The Fuso TP’s engine is so far the strongest available in the range. The truck also comes with a 12-speed power shift transmission and a hub-reduction with optimised rear axle ratios for different applications, giving a strong and reliable performance, in addition to a heavy-duty yet comfortable driving experience. Considering its unique and durable specifications, the Fuso TP is perfect for transporting heavy-lift project cargo in areas of construction and infrastructure projects, making it a key contributor to the success of such projects. Considering that BDF has completed and is currently in charge of some of the most significant infrastructure projects in Bahrain, the Fuso TP was delivered to the company to be part of the success of its ongoing works and future projects. It’s noteworthy that BDF, which was established in Bahrain in 2007 as a leading establishment in the field of Geo-technical, have completed several essential infrastructure and development projects in the Kingdom, including the Isa Town Gate Flyover, North Manama Corridor, Four Seasons Hotel and the Mina Salman Interchange to mention a few.